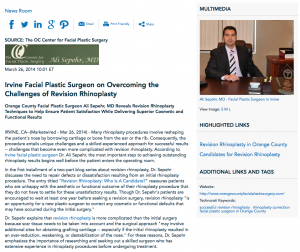 Orange County facial plastic surgeon Ali Sepehr, MD reveals revision rhinoplasty techniques to help ensure patient satisfaction while delivering superior cosmetic and functional results. Irvine, CA – Many rhinoplasty procedures involve reshaping the patient’s nose by borrowing cartilage or bone from the ear or the rib. Consequently, the procedure entails unique challenges and a skilled experienced approach for successful results – challenges that become even more complicated with revision rhinoplasty. According to Irvine facial plastic surgeon Dr. Ali Sepehr, the most important step to achieving outstanding rhinoplasty results begins well before the patient enters the operating room. Dr. Sepehr explains that revision rhinoplasty is more complicated than the initial surgery because scar tissue needs to be taken into account and the surgical approach “may involve additional sites for obtaining grafting cartilage – especially if the initial rhinoplasty resulted in an over-reduction, weakening, or destabilization of the nose.” For these reasons, Dr. Sepehr emphasizes the importance of researching and seeking out a skilled surgeon who has extensive experience in rhinoplasty procedures before undergoing treatment. In a follow-up blog post titled “The Key To Successful Secondary Rhinoplasty,” Dr. Sepehr explains why the most vital step of any rhinoplasty takes place during the consultation process. He explains that, particularly with revision rhinoplasty, the procedure “requires excellent doctor-patient communication in order to achieve success.” Many of Dr. Sepehr’s revision rhinoplasty patients arrive at his private facial plastic surgery practice unhappy with their initial results because their first surgeon may not have fully understood their expectations. In order to maximize the chances of patient satisfaction, Dr. Sepehr spends a great deal of time during the consultation process translating the patient’s cosmetic goals into a treatment plan designed to deliver the results his patients desired the first time around. Having focused his career on the art of facial plastic surgery, Dr. Ali Sepehr earned his medical degree from the University of California, Los Angeles School of Medicine. Afterward, Dr. Sepehr completed his residency in Head and Neck Surgery and Facial Plastic and Reconstructive Surgery at the University of California, Irvine as well as a fellowship in Facial Plastic and Reconstructive Surgery at the University of Toronto. In addition to authoring scientific papers and textbooks chapters on facial plastic surgery, Dr. Sepehr instructs medical students and residents from University of California, Irvine Medical Center. He is available for interview upon request. For more information about Dr. Ali Sepehr and The OC Center for Facial Plastic Surgery, please visit orangecountyfacialplasticsurgery.com or facebook.com/ocfacialplastics.